(Mankato, MN) – Four inches of snow fell in the Mankato area yesterday, but Old Man Winter isn’t through with us yet. 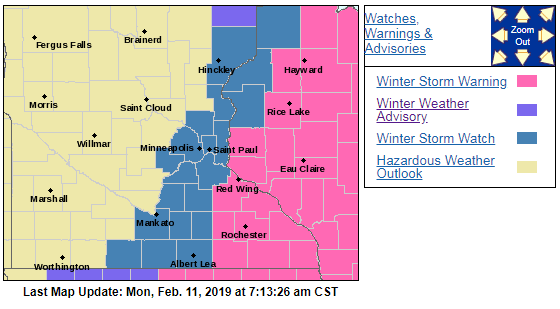 A Winter Storm Watch has been issued by the National Weather Service which carries the possibility of up to 6 inches of snow from tonight into tomorrow. The watch is effective starting at 6 p.m. and expires at 3 p.m. Tuesday. Relief from wintery weather won’t come when the snow stops. Winds are expected to pick up Tuesday, with gusts of up to 35 miles per hour, creating patchy, blowing snow and poor visibility. Wednesday is forecast to receive sunshine and mild winds, but the break appears to be short-lived. NWS says snow is possible on Thursday, with windy conditions and blowing snow the following day. The forecast also calls for a 20 percent chance of snow for Saturday. LIKE Southern Minnesota News on Facebook.